It’s mid Summer and there are loads of activities going on: kids out of school, work, travel, etc.?!. It’s time to re~balance and re~create a sense of peace and happiness from the inside out! Join us for this hour and 15 minute workshop of pure bliss. We will focus on the seven main chakras than run through the spine. 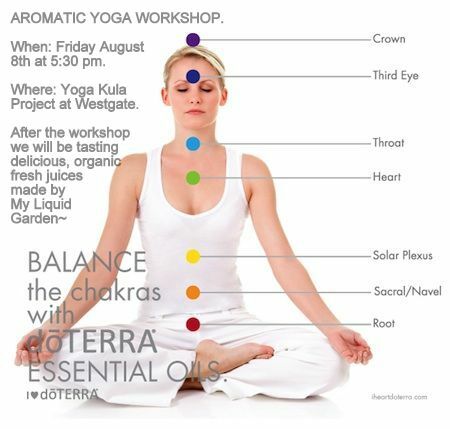 Each chakra will be balanced by using yoga poses and essential oils in conjunction with each other; thus, moving energy and balancing the chakras. After the workshop we will partake of organic fresh juices, made to taste, from My Liquid Garden. Donation Base ~ All Level Class.